Home » Homepage » The Root of All Evil — Bad Communications? Back in 2005, a group of residents were a bit tired about Second Life®’s homepage. It advertised Second Life as a game and was clearly targeted to the market of young creative geeks. Second Life was a MMOG back then, and Linden Lab® did not do much to make people think otherwise. But even then, it was quite clear that SL was being used for far different things — like it is today. This group had a surprising proposal to Linden Lab. Since the world was all created by SL’s residents, why shouldn’t the homepage for “Our World” not be created by us, too? At least, we suggested to launch a second website for SL — one addressing people interested in the business and social aspects of SL, not the youngsters. The major reasoning, of course, was that SL was not captivating many users in the 18-25 range — even then, the average resident was much older than that — and clearly LL was targeting the wrong people with their website. A lot of groups, organisations, and companies never even linked to SL’s main webpage when talking about Second Life as a technology product allowing innovative uses. They preferred to use their own websites to talk as Second Life as they saw it being used. But none were “official”. Of course Linden Lab wouldn’t listen to this. They were used to an innovative concept — one that will make Philip Rosedale probably even more famous than his ideas of the “Tao of Linden” or the “Love Machine” (an internal tool used by LL to send colleagues “love points” when they’re happy about their work). People have recently called this crowdsourced marketing, with a twist: Linden Lab is not paying for it. The concepts of viral marketing are well understood and part of the marketing/branding strategy of a lot of companies and new products: the company starts by hiring a creative team to develop an ad, a meme, or something similarly catching that will get people’s attention. Then, they shoot a video, upload it to YouTube, place links on spam networks, buy ads on AdSense, hire bloggers to write some stories, and generally get the snowball rolling down the mountain. Within days or even hours, other people will start to pick on these tidbits of news and ads, linking to their own blogs, backtracking to pages which have them, use them on their own MySpace pages, and so on. The brands get awareness. They get free exposure on a lot of sites. The backtracking will help Google PageRank. And so on. This is deliberately done by experts who know the Internet market so very well that they can tell a company exactly what will work, and what will be seen as “spam” or obnoxious use of bandwidth. It’s not as easy to do as some business magazines pretend it is, but, done well, it gives excellent results. It is, also, relatively cheap. Linden Lab, however, did not follow this route (or, if they did, they had little success). Instead, they focused on fans of Second Life to spread some news around (through the “Fansite Toolkit”) and spare the costs of advertising in doing what Linden Lab does best: developing software and maintaining a 3D content hosting infrastructure. What they very likely didn’t expect is that these “fans” were actually way more successful than Linden Lab themselves at promoting Second Life. In fact, it was the fans — not Linden Lab — that managed to define what Second Life is and how it should promoted. By a sheer stroke of luck, LL failed their target market completely. Instead of attracting geeky computer nerds in the “young adult” category — which, indeed, comprised the largest part of their Beta testers and very early residents — they got a completely different set of demographics. First, they got older people — people that had their jobs, work experience, training in several skill sets including writing about things. Secondly, although they did obviously attract the computer geeks, these slowly became the minority of Second Life’s residents. People from the social and artistic areas — lawyers, designers, 3D modellers, painters/sculptors, musicians, writers and journalists, teachers (of all areas; not only “technical” and “designer” areas), even politicians and activists, or marketeers and small business owners, are a huge part of SL’s population. And they have something in common. They write well. They have good social skills, and in an environment where socialisation is a prime factor, they manage to establish contact networks quickly, efficiently, and with vast-reaching consequences. In the early days of Second Life, when we had something close to a “utopian community” of pure collaborative work — “having fun together” — residents felt they would be able to “shut out” the Nasty Evil World Out There. They could isolate themselves from the Greedy Corporations. Sure, that possibility was open. They imagined that in the distant future, Evil Companies would try to grab a hold, get a slice of Second Life, and basically destroy what “their” world was. When this happened (starting in 2006), they said “told you so” and shook their collective heads. What they did not realise is that the change was brought by the residents themselves. It wasn’t the Nasty Evil World Out There that intruded in what we were doing in SL. It was not even Linden Lab reaching out for them. No, the simple and plain truth is that the majority of the self-styled SL Evangelists were, in fact, part of the Nasty Evil World Out There, and they were the strongest believers and supporters of Second Life in the real world. They carried the message of what they thought what Second Life should be, and it was their message that ultimately reached the media and turned Second Life into a mainstream product. But the Enemy Was Inside. It was never “imposed” from the outside, either by Linden Lab, or any other external entities. The implications of this model — with which, obviously, Linden Lab was quite happy, since it allowed them to drive support from a large host of free evangelisation efforts — are staggering. Just to give you an example, in 2005, there were 2 universities in Second Life doing a few tests with a handful of students, Everybody cheered, since this was an innovative use of SL that was rather unexpected. LL was very helpful in setting this up and encouraging the novel use. Three years later, the number of teachers, educators, and training specialists increased to an incredible number. Just registered on LL’s own “education mailing list” are around 6000 people. Most of these are not tied to computer science, and few are teachers of 3D design or modelling. Almost all have brought their institutes of higher education into Second Life. The UK alone is assumed to have close to a thousand schools, colleges, and universities operating in SL; the US has far more. Even tiny countries like my own (Portugal) have a handful of universities, a hundred educators, and a few hundreds of students in SL, and about 40 research papers are on the finishing stages to be presented at the biggest of many international conferences on SL next June. But it goes on: large educational consortiums like NMC have set up shop in SL ages ago and continue to grow and expand; foundations like MacArthur are sponsoring educational and research projects in SL; and classes, whole semesters, and in some cases, whole degrees are already being offered in SL. SL, as an educational platform, is now a viable alternative if you wish to take your course remotely. And all this happened just in three years. Why? Well, mostly because LL might have pitched SL as a “cool tool for young adults full of energy to throw a few prims around and have fun with their friends”, but their voice was hardly heard. Instead, a massive network of relationships in academia and research picked up what LL has left — a poor, unfunded effort at self-promotion — cleaned up the image SL had in the media, sold it to their superiors and their peers, raised funding, and started to work with it. And, more important: they started to massively advertise Second Life in a different way. They talked about it on conferences. They wrote on academical magazines and e-zines about the use of SL in the classroom. They chatted about it with their colleagues over lunch or coffee. And later at night, they logged in to SL, and met there with fellow educators, and, collaboratively, they planned what to do next. This went on and on for several months, and gathered critical mass like few other tools have managed to do so. Kudos to Linden Lab to recognise the potential of this selected group and their very specialised use of SL. Very early on, they hired Pathfinder Linden — who was one of the first using SL in this innovative way — to act as a “liaison” with academia (with a tremendous success, since Pathfinder is “one of them”). And LL was quick to recognise that giving academia and research a better pricing model for their land would fuel growth by playing nice. And that’s all they needed to do. Even poor, stressed-out, overworked Pathfinder couldn’t do it all on his own (he started working for LL as his third day job…). He relied on the snowball effect that was being created by normal residents without any affiliation to LL, and was basically the supporting link with the virtual world owners. The rest was done by the residents themselves. Today, hundreds — if not thousands — of conferences about research and educational uses of SL are given world-wide. Linden Lab might not even be aware of the top of the iceberg (ie. the few ones they manage to attend). All these are continuing to spread the use of SL in the classroom (or research lab) more and more. And the pace of promotion is accelerating. LL was at the very beginning sponsoring here and there the first conferences; but these days, they wouldn’t be able to sponsor so many efforts at the same time. They would be stretched thin, and have no budget for them all. But it’s not necessary — the burden of the promotional costs are not on LL’s shoulders, but on private initiative. This is, obviously, just one of the many areas where “crowdsourced marketing” has been tremendously successful. In perhaps two or three years more, no single educator/teacher/academic researcher on the planet will be able to ignore SL — they might not like it; they might refuse using it; they’ll be nevertheless aware of its existence. This “niche” is, however, just one of the many good successful examples where resident’s crowdsourcing marketing efforts have excelled in their efforts. Linden Lab was always very encouraging of this approach. In fact, they would be fools if they discouraged it. Philip might not be mentioned on economics textbooks as the inventor of the Tao of Linden, but he will certainly be quoted for creating brand awareness and raising the customer numbers exclusively through crowdsourced marketing. So why is Linden Lab so bad at communication? Linden Lab has sent out a few press releases in their lifetime. See how incredibly boring they were. The media has no taste for this kind of crap; they get billions of so much more fascinating press releases from Second Life residents every day — around the world — not to mention, of course, what the competition is doing. No serious journalist will pick those news, no matter how successfully Lewis PR is able to push their message across to their own contacts. Boring news are no news at all. Instead, LL has done an effort on communicating through their blog (and leaving the forums, which was their earlier strategy). Why the blog? Well, it’s easy to set up and write. It also allows different employees to write what they feel to be important. It also gets far easily scanned by ‘bots and pops up quickly on Google. So these are the best “official news channel” from Linden Lab. But you can see what kind of news you get there: problems, problems, and more problems. Jacek Antonelli has posted an interesting article on service issues in the recent past. Now imagine the whole array of RSS feeds and ‘bots picking all of this up. If you search for “Second Life is amazing” on Google, you’ll get 3 million hits. If you search for “Second Life problems”, you’ll get 16 million! So this is what LL is communicating to the world at large: their world (not ours), is crippled with problems. Honesty, in this case, doesn’t help much. But — it’s actually a big turn-off. SL works — 95% of the time quite well. But it’s the “bad news” that gets propagated. And like everybody who attended a marketing lesson knows, someone having a good experience will tell 5 others about it; a bad experience gets repeated 50 times. So, in fact, LL is emitting a far darker picture on what their product — Second Life — actually is. There is no amount of “positive feedback” that the residents can do — using their own, far more effective communication networks (of people, not technology) — to blot out this image. But things are even worse. For the past four years, Linden Lab has utterly failed to understand how to present bad news to their own residents (their paying customers! ), much less to the rest of the world. Here’s how they think. They have this novel idea that has to be released. It’s either something they’re forced to do (legislation changes, like having to ban ageplay or casinos) or wish to do (change prices). This might be good or bad — opinions are like heads, everybody has a different one — so they need some feedback. In the past, they had a roundtable of the “proeminent residents” and asked for their opinion. These were usually older residents, people that helped LL to launch their virtual world and make it what it was in the early beginnings. They would be very honest on what they thought about the proposed changes or the new idea. They had, however, as said, a completely different customer profile than the average resident. Based on that feedback, LL broke out the news — and, after massive protests came back in (often to the complete astonishment of LL), they tried to mitigate the impact. In the past, this meant posting in the forums and doing Town Hall meetings. Sometimes changes were reversed. Most often, they were not. If residents had their saying back in 2003, we wouldn’t have an economy or land parcels in SL. Or even permissions. In fact, we would have something close to what OpenSim looks like today. But by imposing these “unwanted” features, LL had a problem. They didn’t know how to sweeten it up. They relied on a few supportive residents — usually outside the group being consulted — to write positive thoughts about their new ideas. These were soon labelled “fanboys” and “fangirls” (and often in not such a nice way) and discarded as being biased, impartial, and drugged with LL’s own Kool-Aid. But this is how they communicated the bad news and expected their audience to react. These days, the resident’s feedback is better estimated. They hold Office Hours, a much better model than the old Town Halls. They do random meetings with residents all the time. They write emails. They post on third party blogs — it’s rare, but they do it as well. They launch new groups, new Wiki pages, new mailing lists. They organise long-term planning groups (the Architecture Work Group is one example). They have secret, heavily-NDA’d “think tanks” (the SL Views programme), of which nobody is allowed to talk about, but at least they get some input that way. They also give interviews (not often, but they do) to RL and SL media — with far more success on the SL media — and these get discussed world-wide through crossposting on other blogs and launching new threads on non-LL forums. They even occasionally do some surveys. And perhaps more important, they have a far larger team of Linden employees roaming the grid doing informal contacts — and pool the feedback together for their management to make a decision. So they get a much better idea on what the residents are thinking before they announce something unpopular. Unfortunately for us, the amount of information they collect does not result in “better announcements”. When the decision is made, it’ll be brought hard on the residents — without thinking twice about form or content. They write what they please, in the manner they find “correct”, and don’t think about the consequences. The truth is, they rely much more on the growth of Second Life — old residents leaving in disgust after another badly managed announcement, but 10,000 new ones coming in every day that have no clue what happened in the past, and will be instantly adjusted to different expectations. The trouble here is that the supply of crowdsourced marketeers is limited. The old rule that “nobody is unreplaceable”, which is also part of Management Streategies 101, is actually a fallacy. People are not all the same. You can just take a look at what they write on the comment section on LL’s official blog. They have different educations and know-how. They have different expectations of SL. The loudest voices are the most unpolite ones. The strongest advocates of free speech are the ones more ready to engage in hate speech (against LL). And these people attack furiously whomever happens to stand by LL and support their decisions for a “better Second Life”. At some point, the old supporters get tired of so much bad press, their own personal reputations as free evangelisers of LL get hurt, and they might deem it’s not worth the effort spent in promoting Second Life any more — if LL refuses to learn from their mistakes and couldn’t care less about doing their business communications professionally. When that kind of people start leaving SL, a fundamental change will occur. The quantity of new users entering SL every day will quickly fill the few scattered lost ones due to another bad announcement, and, in terms of numbers, replace the “lost ones” — at least, for all purposes of statistics or new land sales (which are the important metrics for LL’s own business). The quality of the new users, however, will be quite a different matter. Any successful company will wish to retain their most faithful customers and upsell them more products and services; while at the same time engaging in attracting new ones. If a company’s continued growth also depends on the customer’s promotion of their services to further customers — in essence, making customers agents of LL — there is, indeed, a weakness. You can think LL in terms of their sales department as acting much like Avon or Amway or any similar company. They hardly do sales pitches directly to the end-users. Instead, they rely on a hierarchy (albeit a very flat one) of “evangelisers” who are much better able to gather new customers — either by doing sales themselves; promoting SL on conferences/workshops; or, more likely even, by talking and writing about SL everywhere. However, these “evangelisers” are not LL employees. Similar to Avon/Amway, they’re first and foremost customers. And like any other customer, they suffer from bad communication from LL. If the communication is so bad as to drive them off SL, they’ll be cutting a wide branch of the whole promotional hierarchy — which represents thousands of customers that not only will not return, but they will even prevent new users from coming in simply by refusing to talk about SL (and probably talking about something else). What LL sometimes fails to realise is that they might be a small company, but they have a huge salesforce. In fact, I can pretty much estimate that the “indirect salesforce” of LL right now numbers between 10,000 and 100,000 people — world-wide, on a hundred different countries. That’s not “small”. That’s at the scale of several megacorps. And the cost of sustaining this whole salesforce is zero — a nice word here and there, and not much more. Most of these people will even work for free for LL without “nice words” at all and don’t expect much beyond that — except, perhaps, being kept regularly informed on what LL plans to do in the near future. As a promoter of open-source software as valid solutions to my own clients I often need to face harsh decisions. Most of them don’t have nothing to do with “technology”. A typical example is how to recommend, for instance, what operating system you should run on your desktop computer. Should I say “stick with Windows, it’s what everybody uses, and, oh, btw, technical support will be charged premium, since your machine will be down 30-50% of the time?” Or should I propose going for Linux, saying: “Linux is free and it’s a technologically far better alternative in terms of robustness, you won’t have any downtimes. Oh, but there are no manuals and no technical support, you’re on your own.” The third alternative, of course, is just saying: “Buy a Mac. It runs on Unix, too. It just looks way cooler.” The trade-off here is that it’s not free and will have a maintenance cost, but much lower than Windows. However, there are switching costs to consider, too — people were so brainwashed to think that they have to “relearn computing” when switching over that they will not adopt a different solution just because it’s technologically more sounder and cheaper. This is something that technology companies know very well. Once your customer is hooked on your system, if it works minimally well, they’ll be reluctant to change. After all, even during an “evaluation phase”, you won’t have much time to deal honestly with the technology you’re testing. You just have little time to use it. Either it’s so awesomely better that you can’t believe you could have survived so long without it, or the mere pain of evaluating things will drive you mad. Better stick to what you know — with all its faults — than to blindlessly enter the realm of the unknown on a new technology. In fact, people are more conservative than we think they are. And this means something important for Linden Lab (or, in fact, Microsoft): users will have more patience than we would expect them to have. They’ll prefer to complain, grumble, and even insult the company providing the service, to considering an alternative: abandoning the whole technology and going elsewhere. With Second Life, this is certainly the case. By looking at the numbers for new registrations or new islands being sold every month, we can see that these are still growing exponentially. It’s true that everybody loves to draw nice graphs to “demonstrate” that SL’s growth has reached a peak and is now not growing as fast as before. The difference, however, is very small. In fact, the louder people complain that “the sky will now fall — I mean it”, the more people continue to register new accounts. There are just more people complaining louder. Not necessarily a “mass exodus” to other alternatives. This comes from all these people having a lot of patience. They know that Second Life is “almost what they want” from a virtual world. They will agree that they love 95% of they see — and are seriously furious about the remaining 5%. They’ll be able to log in 95% of the time — and flood the Beta grid, the OpenSim-based grids, the forums, Twitter, IRC, when they can’t. They get a pretty much stable experience out of SL, 95% of the time. 95% of all patches released by LL actually improve something, or at least don’t break anything — except for 5% of the people, where the experience has suddenly become worse. This variation on the Pareto principle is what gives technology companies like Linden Lab a degree of arrogance to pretty much ignore the complaints. “Only 5% will ever complain”. Also, the technology will not work for everybody — the best, in fact, will be to develop it so that it works for 95% of the users. Developing it for 100% of the users is an utopia; but even a development for 99.9% of all possible users is definitely too costly. Doing it for 95% is a good trade-off. There will always be more people to replace the 5% that are unable to use SL; and, in fact, with enough time, those 5% will buy a new computer, change network providers, move to a different city — and suddenly be part of the 95% again. This happens quite a lot. These 5% might, however, be the loudest in complaining when things don’t work. Here the fallacy of the infinite patience comes into play. People will only grumble and complain — 95% of the time. But there is a limit beyond which they won’t follow. There is always a line that they’ll draw, no matter how much they love the technology and the people behind them. Once that happens, that client will go — and, since they have exhausted their patience, they will not come back. Ever. They will also stubbornly and adamantly refuse to admit that they might have been wrong (since they were right, well… 95% of the time… to stay behind the company and support it). They will not rely upon argumentation to change their minds. No, once their patience is exhausted — nothing will turn them back. In my case, it certainly happened with me with Windows. There is no argument that Microsoft can present to me that will persuade me to go back — no matter how much more stable Windows might be these days. It’s not rational (I fully know that Windows XP with the latest patches and upgrades are far more stable than what I was used to in the olden days of Windows ME or even 2000). It’s simply — patience exhausted. And this happens to a lot of residents of Second Life, too. In fact, I think it happens to 1 in 20. The problem, for Linden Lab, is that not all residents are “the same”. While people will certainly applaud if one in twenty griefers go away because they exhausted their patience in trying to defeat LL’s grid stabilisation efforts (when was the last major grid takedown due to griefing? See how people’s memories are short — it was quite some time ago! ), the problem comes when a large number of very active people are actually removed from SL because they’re tired of how things are working. Starax fortunately was one to come back. Francis Chung, formerly famous for launching her Franimation Overrider (which is still used by about 100,000 AOs grid-wide… and it was developed in late 2004! ), her Seburo guns or the Dominus Shadow car, does not create any content any longer after LL introduced a bug that allowed people to easily copy her content (no CopyBot required; it was a LL bug) before it was successfully patched. Not to mention bankers and casino owners who had very successful business models — no, not all were crooks — by engaging the community to come to spectacular places, and which, of course, had no option but to leave. Torrid Midnight, once one of the top fashion creators, is missing these days because it was claimed she was involved in changing another resident’s skin without permission. True or not, sometimes these things will never be clarified. And these — and so many others — are just a big slice of what used to be Second Life. They will be, however, quickly forgotten, but their presence will not. They’re like the removal of an organ of your body — you might survive, but something will always be missing, which cannot be replaced. Since Second Life is shaped by the people who inhabit it, if you remove them, what’s left is… just numbers. Anonymous individuals. The masses. The mob, the crowd. The shining lights who gave magic to this environment cannot be replaced. But why are they so important? We are all unique. However, our engagement with Second Life depends on our personal relationship with the environment, our skills, our network of contacts, our love and passion with the virtual world and its inhabitants. The combination of all those is not found on everybody. Some might be excellent content creators, but have no marketing skills to self-promote themselves. Others might have excellent social skills, but unable to apply them for some reason. Others have a combination of skills — both in talent and in self-promotion — but spend the time hopping between worlds and other activities and cannot focus enough on Second Life because they lack the passion. Others still might have it all, but they despise, fear, or ignore their fellow residents, and thus make no impression in Second Life. But, fortunately, there is a huge group that has all of the above. The only thing they lack is infinite patience, and the patience is wearing thin over time. So what can Linden Lab do about it? It’s clear that Linden Lab is willing to admit they have a communication problem. They’re not the Big Ugly Evil Corporation trying to squeeze us dry while they spend their time drinking martinis in the Bahamas (it’s rumoured that most of LL’s employees are in for the “work of love” towards the virtual world and not for the money — which allows them to find rewards and enthusiasm from a lot of sources beyond the monthly paycheck. It helps, but they could get it anywhere — they’re in LL because they love SL too). They aren’t even doing worse than other companies — from either a social or a technological point of view. To the best of my knowledge, they’re the only software developers in the virtual world business that strictly follow the “release often” paradigm of open source development: they even keep a “stable version” of the client around for a long time, but allow residents to experiment (and give feedback) with the “unstable versions” they’re constantly releasing, often at the rate of one per week. On the social side, as said, they moved out of the forums and the Town Hall model towards in-world discussions (Office Hours), the blog, mailing lists, in-world press releases, and the SL Views programme. They have created “committees” to work with them (the Architecture Work Group being the most famous one), which are open to join (unlike previous similar “closed door” meetings) and publish results and transcripts of the discussions. They know that SL is hard to learn and use, and encouraged a lot of documentation to be read, and Torley produces an astonishing amount of tutorial videos, at a rate that never fails to impress me. They redesigned their Wiki, their Knowledge Base, their support system, and are constantly updating material — this time, with enough staff behind all those documentation projects, so that the “official” information is kept up to date. They publish statistics with regularity, even when those are not so positive — and are the only company in the market who is not afraid of showing them, to the utmost detail. And they even maintain the SL Volunteers (Mentors) group in spite of the increasing abuse of the “Second Life Mentor” title to spread pirated content and do extortion on the welcome areas (something which has made many to leave the group, as abuse reports on Mentors are taking too long to deal with the culprits). Nevertheless, they believe more in positive encouragement of the decent and honest people willing to work with LL, than in punishing the culprits (it’s part of their corporate culture and something which will hardly change). So, overall — and there is more — it seems that Linden Lab does, indeed, have close ties with their customers. They’re available. They listen. Sometimes they even act to what they hear. First, Linden Lab rarely — if at all — look at what the competition is doing. Not the competition on the virtual world side of the business — these are closely followed, but mostly because of technological issues (SL has to be as easy to use as, say, Habbo Hotel, and look as good as the upcoming Sony Home…). But the “competition” coming from hosting providers and other technological companies. Most of the residents in Second Life have been on the Internet for over a decade — some were almost literally “born” with it (and they’re still on the Teen Grid), but others have used it extensively for a decade or more, no matter what their age. Being “childs of the Internet age”, we expect an “Internet company” to behave according to several standards of expectations. One is that “everything has to work”. Nobody remembers the outages in the mid-1990s. When Gmail chokes due to a sudden increase in spam, it becomes front-page news or prime time announcements on TV: it’s so rare that people forget that it can, indeed, happen. Companies doing business on the Internet have long been providing 99.7% guaranteed uptime to their customers. We’re simply not used any more to an Internet-based product that crashes our computers or has “only” 95% uptime. We’re not used to tell people on the phone that “I’ll send you an email — if it works today” but we do that for Second Life. SL is not robust enough to our expectations of work, business, and education. But it’s not because it’s “getting worse as time goes by and more residents come in”. Not at all: in fact, it has become constantly better over the years — going from, say, 90% uptime to 95% in 4 years, which is far more important than people realise. We’re also used to things work on top performance no matter what our computer is — reading Gmail, for instance, should not make a difference if you’re running Opera 4.0 under Windows 98 or Safari under Mac OS X Leopard. It works. Even on your PDA or Web-enabled mobile phone. You don’t expect less than that from a crucial functionality of your online life. But Second Life constantly crashes (it is now the only application that can make my Mac crash and I’ve seen Linux boxes hung up by SL — a weird feeling for someone that has promoted these as “uncrasheable” alternatives for almost a decade. No, they’re as liable to crash under SL as Windows, perhaps even more so) — so people get frustrated. Well, again, it’s a matter of comparing things. I’ve often reported to friends that I can’t login to most virtual world platforms out there. IMVU, There, vSide, and MOOVE are the exception — they work — but the rest simply won’t install. Some are utter nightmares to download — I can wait for SL to download in 5 minutes, but the last time I downloaded Kaneva, it took me 4 days, running the computer 24 hours a day, and in the end, I just got a black rectangle. Nothing else. It never worked. In contrast, I get SL working at 15 FPS on a 4-year-old PowerBook G4 which is flagged by SL as “unsupported hardware”. I managed once to run SL on a iMac from 1997 — which has a G3 processor and is supposed not to be able to run it! I got 1.0 FPS out of eMacs. A Pentium II @ 266 MHz with Ubuntu installed and a way old card (pre-nVidea generation) managed to squeeze some decent 3 FPS on a 1024×768 screen. In late 2004, I managed to run SL from my laptop, dialling out on my mobile at… 9600 bps. Sure, don’t ask me about the lag, but it was possible to chat and attend meetings, so far as you weren’t expecting any textures to load. These are, of course, very extreme examples, requiring a lot of time and patience to tweak in order to get SL up and going, and they should only be taken as proof-of-concept that SL, with enough patience, will run on outdated and low-end hardware too. Not so with their (current) competitors. They either work well or not at all, and people that never managed even to install it will definitely not complain or write about it — they’ll go away, never to return. So it’s definitely not about the technology. I often give the example of what I consider the worst Web hosting provider that has the best communication ever with their customers: Dreamhost. I’m going to bring it up again. Dreamhost is very clever. They compete in price. They have weird business models, where a part of the revenue somehow comes from people getting donations to pay for their hosting. And they’re constantly plagued by all sort of problems — much like LL. I never saw a data centre being run that had so many problems as Dreamhost’s. There is hardly a day that something doesn’t fail. And when everything is running smoothly — a rare exception! — people will launch all sorts of rogue scripts to attack other servers, spam them, or run Denial-of-Service attacks on friends and enemies. It’s a nightmare. Dreamhost long ago decided that they wouldn’t run Service Level Agreements on their services — it was pointless to assume them, since they cannot. Instead, they provide “best effort” services — they make an effort to get close to 99% uptime or so, but that’s not guaranteed. So how can they survive in a market where every other web hosting company pledges 99.5% or even 9.7% uptime, backed up with money if they don’t provide that, and are constantly dropping prices and adding services too? They do it with excellent communication, outstanding customer support, and automatic detection of failures — and being insanely quick to reply. First, they don’t have a blog where all information is pooled in, good and bad, and try to make light of the bad news while focusing on the good ones. Instead, they have the “corporate blog” — which is hilarious to read — and which is just marginally related to what Dreamhost is doing as a business. You’ll see far more stories about parties or how one of the founders lost their iPod on a pond than addressing customers’ complaints. Every month or so, you receive a “promotional” newsletter by email from one of the managers — someone who can write even funnier things than Torley. In fact, it’s so funny to read (remember, this is supposed to be a serious company with a million active users…) that you quickly forget that it’s actually a form of spam: they send the newsletter mostly to inform their customers about their new products and to encourage you to buy more. But they guarantee that you’ll be still laughing when you finally finish to read it. The message gets across, though. People wait for the next newsletter not for its informational content, but for the laugh. Then they have a “status” blog. This is the Bad News Happen Here blog — people only see it if they suspect that something might be wrong. Outages, planned maintenance, failures, network slowdowns are all posted there. They are constantly updated, the information is highly technical, and there is no intent of “making light” of the severity of the issues. But sometimes things are not working and they’re not on the “Bad News” blog. What then? They have an astonishingly good backoffice to your account. Forget cPanel, Plesk, or anything like WebMin/UserMin — this is centuries in the future, and Dreamhost is not licensing it to the competition. If something goes wrong, you go to the Support area. The first thing it does is to allow you to select what areas of your service aren’t working — it might be mail not coming in, your website being slow, your site not showing at all, or anything else. You can pinpoint the services that aren’t working as you expect with a bit of detail — enough for experienced people to distinguish between “being slow” and “not displayed at all” or “DNS failure”, but easy enough — step-by-step approach — to allow utter newcomers to the web hosting business to at least give a rough idea of what is not working. Then — and this is the ingenious part — the system self-checks. It runs through all your services while you wait a bit. Then it does a report. Then it cross-checks the report with what was announced on the Bad News blog. Then it searches for similar tickets on the same issue. Then it looks up on their Knowledge Base. And if all else fails, it goes next to give you pointers to the Wiki which might have some suggestions. And, last but not least, it gives you a list of the 5 or 6 most possible reasons (based on previous tickets) for what you’re experiencing. You can still click on the button saying “Do you still wish to continue?”. They expect that 90% of all users filing a support ticket will not need to go on. They’ll know the system is down, and why. They will immediately notice when they’ve forgotten to click on a button or uncheck a box to make sure their site runs well again. Effectively, Dreamhost is narrowing down the need for most people to complain/ask for support. Their system will automatically help people with their issues. But let’s assume that you still click on that “continue” button. What happens next is that you get an answer from the tech support rep — almost immediately. I’ve filed several tickets in the past years — sometimes, the reply (and the solution) comes in while I take a toilet break. At least, I’ll have an apology — written by a human, not a ‘bot saying “Thanks for your reply, a tech rep was assigned to your problem and will shortly follow up with you” (which they never do). I don’t need that email, because, thanks to some clever idea by Dreamhost’s programmers, I can see all communication with Dreamhost on a special web page. So if I suspect that my support ticket did not go through — say, because email with Dreamhost is down! — I just need to go over to that web page and see what the status of my ticket is. No complex things here. Once I’ve logged in to their backoffice, everything is there, in plain view, a mouseclick away. No complex interfaces to master. No degree in computer science is required to file a request for support. And they fix everything all the time. The longest I had to wait for a solution was 48 hours — and it was due to a storage array that utterly failed and they had to buy a new one, reinstall it from scratch, and retrieve the backups. During all that time, my site wasn’t down. It just was “slow”. So, all my friends tell me to move over to other hosting providers. I’m pretty sure that many will post on the comments and say “try provider X, they have far better service, and cost even less than Dreamhost”. They might be right. In fact, I’m easily persuaded that they are right — Dreamhost is, by far, the most “unlucky” service provider I have met (well, just after Linden Lab, in fact), since there are always problems. Every day. Lots of complex problems, too, nothing easily fixed by rebooting a machine. Where I do professional hosting, servers have uptimes of years, not days. A disk failing or a router getting unplugged is so rare that sometimes we forget that a machine is still hosted there — until one day you get an email out of nowhere saying “your server is not responding”. That’s the kind of service I’m used to. 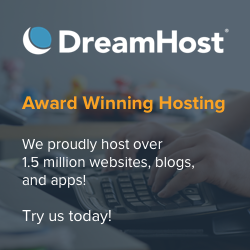 Dreamhost is just the opposite: a hosting provider where things “barely work”. Why am I stuck with them, then? Well, for starters, they’re cheap — as cheap as a premium account at SL. But the major reason is for their excellent contact with their customers. They know very well who their market is — usually young people with a sense of humour. They know very well that 90% of their users can barely click on a button to install, say, WordPress — so they make everything easy. They also know that in 90% of all support cases it’s always “user fault” — people clicking the wrong buttons, disabling things they shouldn’t, tweaking settings that they weren’t supposed to do, and so on. For all these cases, they have a clever application which tells the user exactly what is going wrong. They keep everybody updated on the bad news, and believe me, there are enough to report. They’re just not in everybody’s eyes, like LL’s blog. They’re hidden away where you know they are when you need to look at them, but their official blog and newsletters is for reporting fun things that are happening — while very subtly encouraging you to upgrade. And when all fails, they’re super-fast at replying. I’m not saying that Dreamhost is the best hosting company in the world (I think that if you wish 99.999% uptime with no hassles, you have just the choice to go to Verio and order a server for US$1000/month — you’ll never have a single problem with them and can safely forget their tech support email or phone number). It’s just that you can have a successful company with lots of technological problems if you can successfully communicate with your customers. This is where LL continues to fail. They are aware of the technological problems. They are even honest enough to fully assume them publicly. They address the issues — slowly, of course, but they do that. However, they seem to lack understanding on how to address the issues. Their latest trend is that “Bad News” (meaning mostly: unpopular decisions) are to be announced quickly, swamped in the middle of dozens of positive articles, and let the complainers whine and (hopefully) leave SL not to return. They do this constantly. A few individuals (like, of course, Robin) will then try patiently to soothe people’s nerves and encourage them to be patient with conversations in a relaxed atmosphere, by asking them in IM or email how they feel about issues, by inviting people to attend their Office Hours or some specially arranged meetings (like Pastrami’s 4-hour-long-mega-Town-Hall). This is all trying to patch things “after the harm is done”. If they’re so bad at announcing bad things to the residential customers (the individuals that are in SL mostly for leisure), they’re even worse at communication with the professional users (the ones that use SL to make a living). There is no “roadmap” for what LL is planning to do. We don’t know what changes will happen, or when. We have to try to guess from hints and leaks what LL is up to — and sometimes they simply abandon a project without saying why. Imagine a simple case. LL has awful Linden trees, with lots of permission problems (and that can’t run scripts! ), and, for long, people have designed new trees out of “cardboard” templates and sculpties. They look ugly — compared with other virtual world platforms — but not as ugly as LL’s own trees, and at least they’re objects like any other. Now, LL has bought licenses for a technology called SpeedTree (allegedly as far back as 2003 — take a look at the screenshots and compare them with what Linden trees are able to do) which should fix all these issues and give us, residents, the ability to create wonderfully detailed and low-lag trees without using prims and without the limitations of the “Linden trees”. Rumours, again, tell that they have revived that project (since we all know how the Linden trees seem even more ugly under WindLight…) and are working on it again. But… where is the announcement? When is that going to happen? If I start a 6-month project today that will require extensive gardening and landscaping, will it be finished before SpeedTree is introduced in SL, or will that happen half-way — and force us to redo the whole work? (at our own expense, of course, since the customer will not pay). The same for things as shadows — will rudimentary shadows be introduced in the next 6 months, allowing designers to get rid of “fake”, pre-cooked shadows to make their builds more realistic? Will the avatar lighting model be fixed/changed so that 3-way FaceLights, so popular these days, aren’t used any more to “steal” available lights for a scene (OpenGL only allows for 8 dynamic lights, 2 of which reserved for the Sun/Moon and ambience lighting, so you effectively only have 6 available), and thus allow builders to design their creations again with dynamic lighting? We have no clue on any of those things, and LL is not going to reveal that “privileged” information. They claim that they’re so bad at doing internal planning that they would just raise expectations and then utterly fail the deadlines (see HTML-on-a-prim or Havok 4 — yes, both are here now, both are working, but they were “planned” to be launched… in 2005, not 2008!). All these things lead to severe frustration and ties up our patience. Why can’t LL publish a roadmap of their planned changes? Why are these discussed at the heavily-NDA’d SL Views sessions that never leak anything out? (and, believe me, some of those topics discussed behind closed doors are scary) Even OpenSim, which has far less resources, publishes a “tentative roadmap”, where it’s clear that things will be close to “2004-level” SL-compatibility in only 1-2 years. They might delay some things — or get unexpected help from new sources, namely, LL themselves, or even IBM and Sun programmers, and get things done faster — but at least there is a more-or-the-less clear road for us to follow. There won’t be many “bad news” by the OpenSim crowd. Then there are the “mixed signals” that confuse and frustrate people so much. One of the reasons for open sourcing the client was to get a lot of more programmers to look at the code and fix it. It would naturally take time — 20 MBytes of alien source code, written over a decade, most parts of which undocumented and done so long ago by people who left LL for ages, is not something easy to understand. Still, quite a lot of residents have started to publish patches and fixes for the most common problems. These are publicly posted on the JIRA. Some are six months old and still haven’t been applied to LL’s code. Some are even older. Nicholaz Beresford has been constantly applying all those patches on his series of browsers as soon as LL releases a new version of the source code and done an outstanding job of having highly stable versions of the SL client — or fine-tuned ones for better performance. If one person working part-time, with no previous knowledge of the SL client, is able to quickly learn how to fix and patch long-standing bugs — why can’t LL’s array of developers do the same? Why don’t they simply use Nicholaz’ patching scheme and implement it internally? Or, for all purposes, why don’t they hire Nicholaz — either as an employee or an outsourced company doing the patching? Earlier on, the excuse was that “we need to take some time to test the resident-submitted patches before we apply them to the code”. Sure, that’s a reasonable excuse. But the reality is that Nicholaz’ patches work, are tested by thousands of users over long periods, and his line of SL viewers always have either top performance or top stability; while LL’s own patches are done in a hurry, at 4 AM in the morning before Friday, and released with unpredictable consequences. Something is seriously wrong with this model. Yes, of course developing for such a complex infrastructure is way harder than people believe it is. But if Nicholaz is able to do it, why can’t LL? Surely they’re working from the same code, the same patches, and developing for the same complex infrastructure!? A very insightful person once told me to look at what people are doing rather than listening to what people are saying (which more or less is a variation of “actions speak louder than words”). No wonder he’s abandoning his efforts in frustration. Obviously, we have to deal with an ever-changing market, where conditions change so fast that long-term plans might become impossible. Nobody denies that SL — and the use given to SL — is currently totally unpredictable. Nobody ignores also the plain, simple truth: the “competition” is not looking at user-generated content to build a “metaverse”. Linden Lab is the only player in the field that has a successful business model to allow them to do that. The future is not really “interconnecting competitors”, like it was vented last year. No, the future is the InterGrid — a set of privately owned grids, running a variation of the SL protocol, where all people will use a similar technology (or at least compatible between them) and log in at any point and being able to view all user-generated content that was deployed on any of those grids. The InterGrid will be running on variants of Linden Lab’s “SL Open Protocol”. It will be something completely different, and with totally different purposes, goals, and objectives than what the competition is doing — which is mostly pushing virtual worlds to kids and squeeze money out of excitable and naive teenagers. Well, that’s actually good to know — they’ll keep the way clear for Linden Lab to focus on the professional, adult market, which is by far the most interesting one, and the longest-enduring one. Living in a very uncertain market makes communication way harder. However, Linden Lab has not only to listen to their customers (which they do), they have to start to talk to them differently. They have to enhance their communication skills and make sure they know how to break the “bad news”. They have to make it far simpler to contact them for technical support and social enforcement of the rules (like piracy and griefing). They have to focus on the three major groups of SL residents — social, educational, business — and address them separately with different communication tools. Second Life Grid works as a prospectus, but it has to evolve. It has to stay away from “technology” and promote “business”. It has to avoid “cool things to do in Second Life” and focus on “people communicating and collaborating”. It has to be viewed by prospective customers as “enabling better business” and not “an investment in technology”. “Secret meetings” about roadmaps and planned innovations and business opportunities should not be stored hidden away from the public — instead, they should be the focus on LL’s business announcements, they should generate press releases and promote technology experts to talk about LL’s platform on the specialised media. Case studies — like the ones shown on LL’s sites — are very encouraging, and there should be a coordinated effort by LL to make sure they get into the hands of the people needing them more. Affiliation programmes, certification training, and partnerships should all be part of LL’s plan to address corporate needs, and launched without “fear” of “damaging the community”. Business is what will drive SL into the 2010s, and successfully making the corporations happy about working with LL is the key to success. Look at how Microsoft, Apple, and even IBM, Sun, or Oracle, are heavilly encouraging business partnerships. Partners are the best way to spread the news out — but partners need clear guidelines to do so, and cannot be threatened to have their avatars banned when they’re doing active promotion of LL’s products and services. Conversely, LL should be co-promoting their own partners, and making sure their partners’ communication is wide-spread as well. The old fears of “bias” and “partiality” have to be shaken off and purged from LL’s internal qualms. Their corporate culture should focus on promoting their partners as they promote themselves — Second Life, the product, will gather more attention if Linden Lab is willing to work with them more closely to allow co-promotion, cross-promotion, and cross-selling. At this level, we’re not talking about a crippled ToS, but about business relationships and partnership agreements. There is a whole lot to be done in that area by LL. But on the social side, it needs a completely different approach. “Bad news” and “technical failures” should be reserved for special channels of communication. The residential user has to have better tools to diagnose their problems and easily fix them on their own without bothering LL. They need easy access to support systems. Having a lot of tools to help is better than none, but a far better effort should be made to unify all those systems. A few third party sites already offer applications that will test a user’s hardware and tell them if they’ll be able to run SL or not — why doesn’t LL do the same on their sign-in page? It’s good that the current versions of the SL client attempt to identify a graphics card and set it to the best settings. but clearly a lot more has to be done on that area. WindLight was profusely tested by tens of thousands of users who gave constant feedback — but they were all “early adopters” who knew how to configure their settings, download new drivers, and have enough knowledge on how to tweak their computers. Clearly this lead LL to a false sense of security — if it works for tens of thousands of users, it should work fine for tens of millions. This cannot happen. Apparently, SL needs to have a “light version” for technically handicapped users, who have limited experience in working with their computers, and a “power user” version for anyone willing to spend some time configuring things in order to run the software. Their nearest competitors assume that users will either be able to install their software and it will always run, or it doesn’t install at all. But once it runs, it will always run — flawlessly, even if with very limited functionality. This requires a different approach to the whole viewer technology — targeting not the low-end computers (which LL does) but the technologically-handicapped users (which they don’t). LL also has to switch the focus (again) on the social issues, and not developing technology to “codify” rules. It’s not acceptable to sign a ToS with LL that says one thing, but employees of LL will claim the reverse is true, and be forced to use the courts to understand what exactly people have agreed with. Issues like copyright protection and what is deemed to be acceptable content have to be clear from the start, and simple, effective means to appeal a decision (outside a court) should be put in place. Unpopular decisions should have a way to be addressed, with patience on the side of LL not only to listen, but to act upon them. Residents are used to other popular tools and environments where flagging something as unacceptable is swiftly removed first and questions asked later; LL does the reverse: allowing everything except when forced otherwise. If LL is not prepared to do any enforcement, let others do it for them. Outsource the mainland if there are not enough LL employees willing (or availabe) to do any enforcement there. Make Abuse Reports more organised and clear to fill out, because, if not, they will just be used as “venting frustration” at other residents and not used as a clear tool for properly reporting abuse. Address mediation and arbitration even more than just posting a few links, obscurely lost in the blog, by making these pop up somewhere (even on email) as soon as an abuse report is filed. And finally, the largest growth of the use of SL has been on the educational area, because it’s a product with immediate success rates and a good ROI. Pathfinder Linden has been crucial in developing and expanding that area. However, it’s also quite clear that he’s totally overwhelmed by requests. A whole support structure should be in place to deal with educators’ requirements — from documentation, tools, research papers — to a “Second Life Education” portal (not just a Wiki and mailing list) run and staffed by Linden Lab employees, which will also handle support for the educators, but, more important, also deal with the tricky issues like getting proper invoices from Linden Lab. New residents signing in for “SL Education” should have their own areas — a welcome area on the SL:Campus sims would be nice — and a way to quickly set themselves up bringing whole campuses full of students to SL. Since all of these have very strict firewalls, the effort to move away from proprietary ports and just use web-based protocols (or, at least, the ability to use port 80 as the only one) is crucial for allowing SL in the campus to become a tool as widespread as Moodle. LL needs to clone Pathfinder a lot of times — a group of people at LL who understands the requirements of educators, colleges, universities, even high schools, and research institutes, who talks their language, knows their needs, listens to how they use SL, and change LL’s communication to address that specific market. I’m often been accused of claiming that no matter what happens to the other two areas of SL — business and social — the educational use of SL in the classroom will always make it a valid platform, no matter what the rest will do. SuperMegaWorld might be around by 2010, with flawless performance, no technical issues, and astonishingly good graphics, and everybody will be jumping over to it, but the universities will continue their work with SL as the only viable platform addressing their needs, and be busy integrating campus-wide OpenSim-based private grids and interconnecting those with Linden Lab (now that IBM is showing how it can be done). So, yes, there is quite a lot to be done to address what I perceive as the Root of All Evil: Linden Lab’s deficient communication skills. They’ve gotten better at it, but it’s still mediocre at this time — and 5 years of running the service should not give LL a continued excuse to lower its priority. The rest, the technical obstacles — like the ones at Dreamhost — will be much easier to deal with once good communication is established.